Sierra and I got ambitious this weekend and, in taking advantage of the good weather, decided to plant some flowers for our doorstep. We took a little trip to Home Depot, where we ran into Grampy, and Sierra was so excited to have such a large selection to choose from. She giggled the entire time because she was so excited the decision was all her's (or so she thought). She was set on all purple flowers but I pursuaded her to mix it up a bit so we ended up with white snap dragons, pink tulips, and some other flower that I can't remember. When we got home we pulled out the GIGANTIC bag of dirt (that says it will feed my plants for up to 4 months so hopefully they don't die) and realized we didn't have any shovels. Si ran into the house and produced two big kitchen spoons and we got to work. 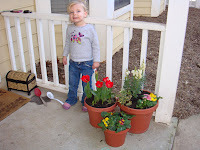 We had three pots and with our little spoons it took us FOREVER to scoop all the dirt into the planters but we got filthy dirty and had a fabulous time doing it. 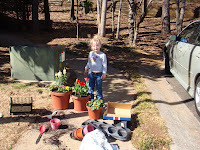 Sierra didn't quite understand why we had to fill them up but she was fine with playing with the dirt. 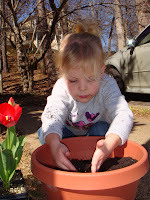 She switched spoons often because she thought mine was scooping more dirt than hers was. 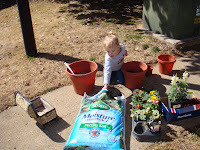 When we had the pots full she patted down the dirt to make it even before we put the plants in. 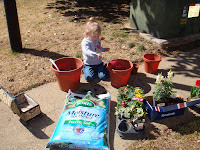 Her favorite part was pulling the flowers out of the plastic holders and squeezing the dirt and roots apart. She's grab onto them so tightly and make a funky face and say, "sssssqqqqqqqqqquuuuuuuuueeeeeeeeeeezzzzzzzzeeeeeeee", then put them in a pot. She's hilarious. When we were all finished she stood up, held out her hands and said, "just look at the mess we have made!" Great day with the Bug! Check you the fruit of our labor. It's been 5 days and they are still alive!